After I came home from our Aruba trip, I had to make something with my Vita-Mix. I just had to turn on the beast. It had been 3 whole weeks and my hearing had normalized so any sane woman would turn her Vita on at 2am after being awake for 24+ hours if she was apart from her beloved appliance for 3 weeks, right? 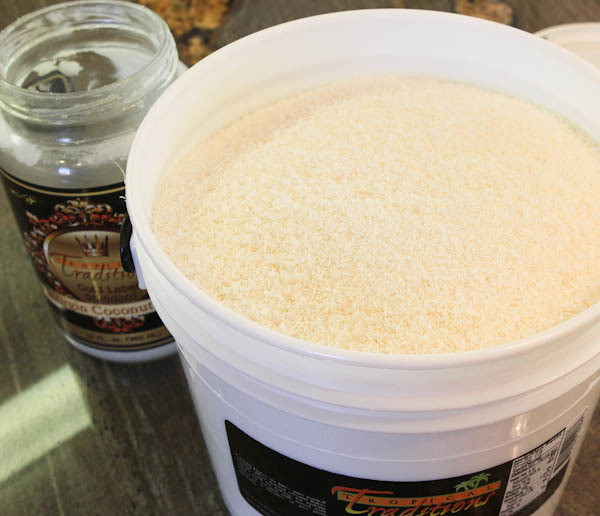 I looked around the kitchen and my vat of coconut flakes and coconut oil were calling out to be used. 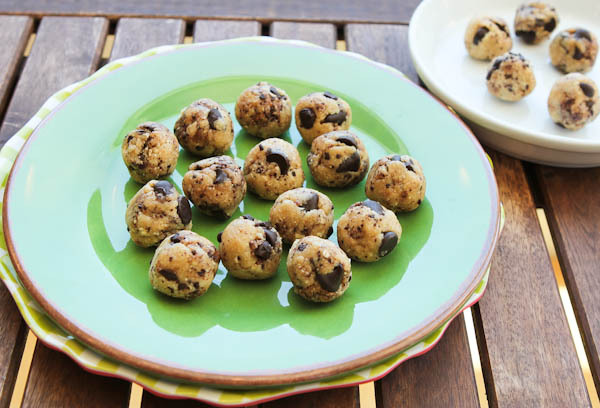 If you like cookie dough, infused with the flavors of coconut, these are for you. The coconut flavor is present, but not overpowering, and I love the combo of coconut + cookie dough + chocolate. And if you “don’t like coconut”, well, try it again. You’ll come around. I sure have over the years. And if you still don’t like coconut there’s just more of these for the rest of us. Fine by me! 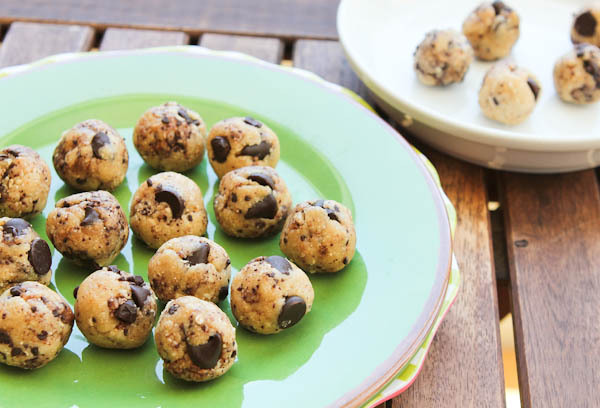 For the non-cocnut fans, you make these non-coconutty raw vegan chocolate chip cookie dough balls instead. And for the coconut lovers, enjoy the recipe. First add cashews, coconut flakes, and oats to Vita-Mix or food processor and grind into a fine powder. Then, add the agave, vanilla extract, and coconut oil, and blend again. Finally, the chocolate chips and either stir in by hand or barely blend/pulse until incorporated. Retain some texture to the chips or chunks. Add dried coconut flakes to each bite by rolling them in coconut flakes at the end. 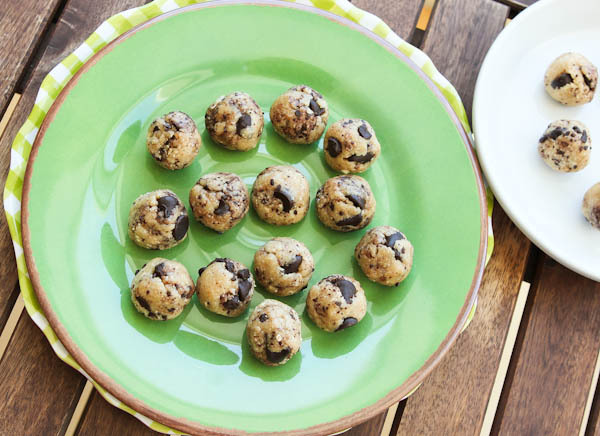 Pop a coconut cookie dough bite, or four, as a snack. 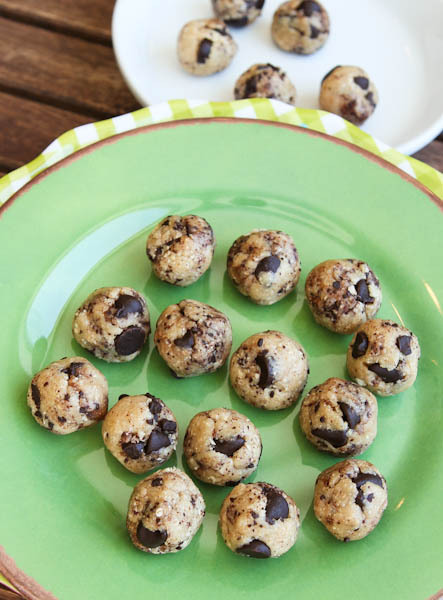 A snack that happens to be vegan, gluten free, soy free, dairy free, and that you can make in 5 minutes. I promise they don’t taste “healthy” or “healthified” even though that description made them sound like they may. Or eat them as dessert. At 4am after a long night out. Or for breakfast with coffee. Mmm, good. Or really just any time the Cookie Dough Monster comes calling. Which, for me, is quite frequently. I store all my bites and balls in the freezer so that I have a wide variety and assortment of different flavors on hand, at all times. Freezing has no effect on the taste, IMO. Major blessing. 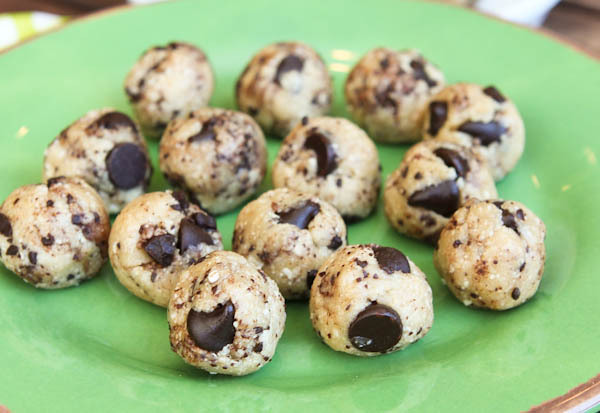 My grandma used to keep about 17 different types of cookies in her deep freeze in Folger’s Coffee cans and I suppose raw vegan cookie dough bites in the freezer is really just a new variation on her very old theme. I can just pop of few of whatever flavors I want rather than having to make from scratch at a moment’s notice and you know how it is when you get that sudden craving! Now I can add coconut flavored dough to my recipe arsenal. An to the freezer. That makes me happy. I am also adding this recipe to my Coconut Recipes post so if need ideas for how to use Coconut Oil or Coconut Flakes, I’ve got plenty of suggestions with photos there. As well as to my No Bake/Raw Dessert Balls & Bites compilation post with photos, too. I’m glad you liked my last post, Powder, and the product reviews. 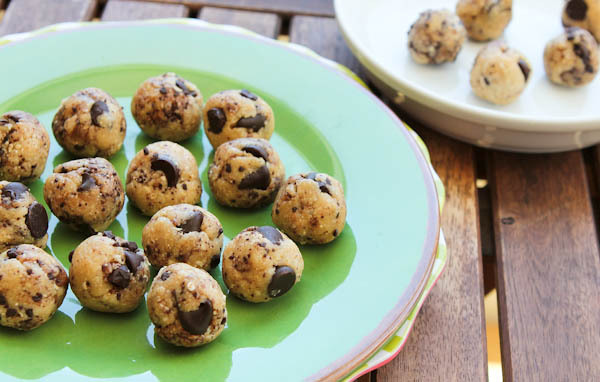 Making, and eating, these coconut and chocolate chip cookie dough bites ranked right up there. As well as enjoying the sunny, albeit cool-ish, weather. 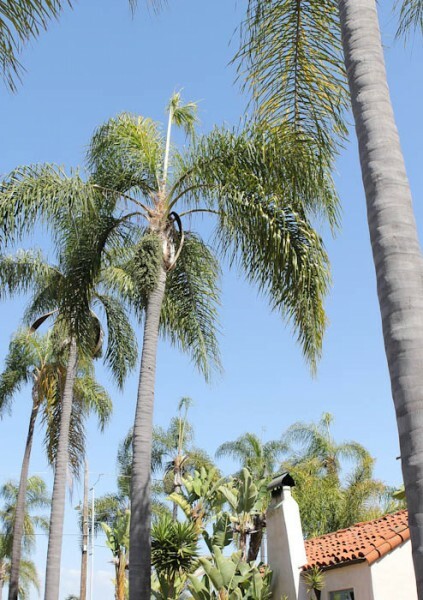 After being in Aruba for 3 weeks, 70F and no humidity in San Diego feels cool. Spoiled, yes. And I went and did something fun Saturday afternoon. More on that in my next post. 2. Do you like coconut flavored things? I never used to like coconut but as time has gone on I like it more and more. Now, I can’t really “taste” coconut oil in recipes the way I used to be able to about five years ago. In fact, I have come to adore coconut oil in desserts. Or for roasting veggies. But raw vegan coconut oil chocolate is a favorite of mine. Chocolate recipes using coconut oil trumps using it for veggie-roasting in my book. 3. 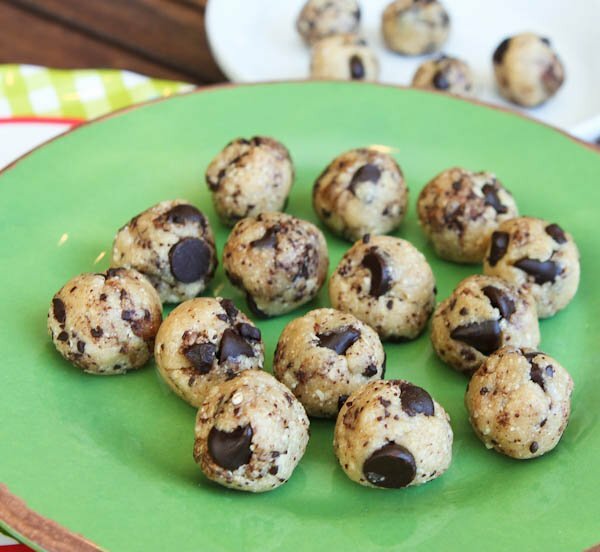 Favorite kind of cookies or cookie dough? Fill me in and inspire me to create something else! YUM! I’ve been REALLY into coconut lately. Like, eating coconut butter out of the jar, lately. 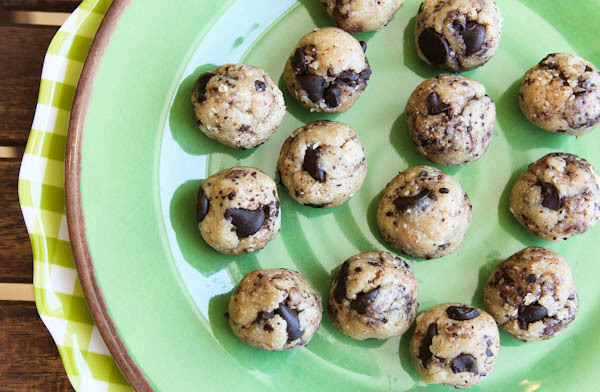 Coconut + chocolate in COOKIE form? Even better. 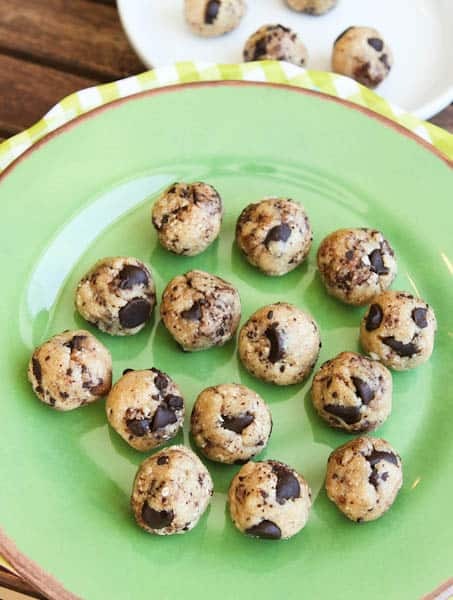 Your No Bake Coconut & Chocolate Chip Cookie Dough Bites look delicious. I’m printing it off to make for my hubby. He ran out of your bars last night and the freezer is too full to fit another pan. So these will hold him for now. I LOVE coconut flavoured things. Can’t stand the artificial scent in sun screen though. Yuck! I’ve been craving cinnamon and ginger flavoured things lately. I modified your raw vegan chocolate recipe and did up a batch. Turned out pretty good. More like fudge than chocolate. thanks for lmk you made the chocolate and hope you enjoy this latest recipe! Coconut flavoured things are my FAVOURITE!!! I love coconut scented things too!!! My favourite type of cookie/cookie dough is chocolate chip. What do I do if I dont have a vitamix? 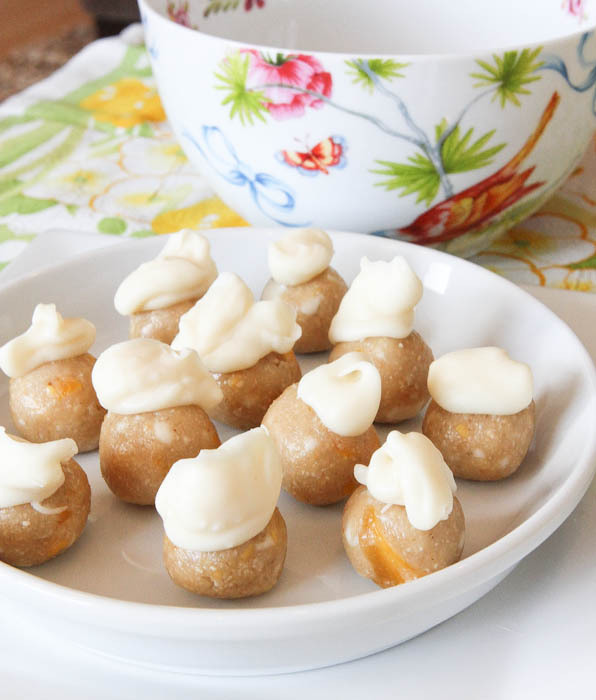 How do I make the coconut balls? Just made these for an afterschool treat for my 6 and 5 year old. They were a hit! My son said, “Cashews?! No way, mom. That means they are kinda healthy? We should call these ‘amaz-balls’!” Thank you so much for the inspiration. I can’t wait to try other flavors. Three weeks without your blender?! I was without mine for a week when it broke & I thought I was going to die! 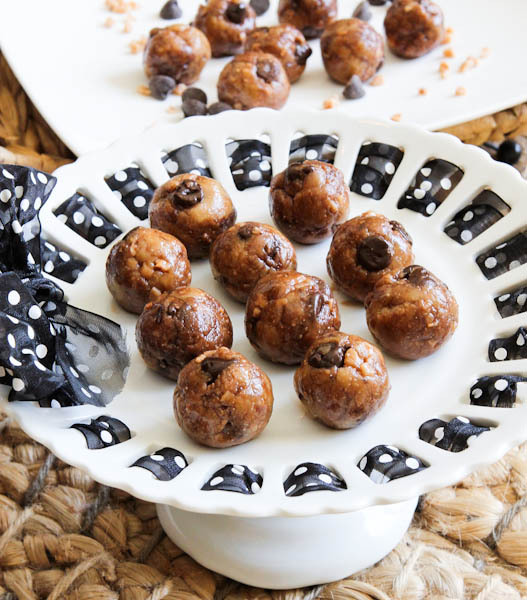 I am a huge coconut lover & toffee lover and those cookie dough bites look ah-mazing! Unfortunately, there’s too many carbs in them for this gestational diabetic. Maybe I’ll try them after the baby’s born. This is an older post but I was looking for sugar free desserts and this popped up. I love everything on this blog but need a small sabbatical from sugar right now. These came out so good! I used a few drops of stevia and left out the maple/agave syrup. I used unsweetened coconut and a little extra coconut oil. I did add the 72% TJ pound plus chocolate that has a little sugar in it, but not enough to count for me. :) We will be enjoying these today, because I’m sure they will not last much longer than today. So glad that you enjoyed these and that they came out so well for you! And yes, it’s a small batch and they do go quickly :) LMK if you try any other recipes!